A brief, new spy video provides a fresh look at the Porsche 718 Cayman T and provides a great opportunity to hear doing some hard acceleration. We might even get to see a full debut in just a few days. The 718 Cayman T appears to blend styling from the GTS and GT4 models. This one rides one wheels with a retro-modern look with five, thick spokes that subtly evoke the Fuchs design from classic Porsches. There's a diffuser at the back and a pair of large diameter exhaust outlets. VIN filings with the National Highway Traffic Safety Administration indicate the 718 Cayman T uses a 2.0-liter turbocharged four-cylinder and has a gross vehicle weight rating 66 pounds (30 kilograms) less than a standard 718 Cayman. Oddly, the example in this clip doesn't quite sound like a turbocharged four. The exhaust note seems to have too much bass and has a deeper note a little more like a six-cylinder mill. 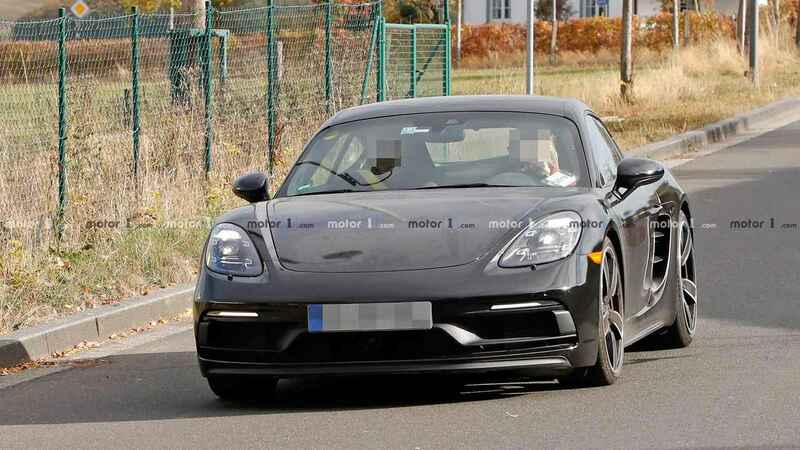 However, Porsche might have some throatier pipes on the Cayman T to create the baritone noise. The hotter Cayman reportedly sits below the Cayman GTS but puts a focus on driver involvement. To save weight, Porsche reportedly fits thinner glass and fabric door handles. An audio system also allegedly isn't part of the standard equipment. The company also allegedly adds equipment like a new exhaust and Sport Chrono Package, including a 0.4-inch (10-millimeter) drop in the suspension ride height. The 718 Cayman T will reportedly go on sale in Europe in 2019. We are taking the claim with a whole container of table salt, but a commenter to this YouTube video claims that the online debut happens on Monday, December 17. Even if this isn't the case, registering a VIN in the U.S. indicates the coupe is eventually arriving in America. We expect the price to fit between the $67,700 718 Cayman S and the $80,700 GTS.